Black River Pearl is a rock band. A Psychedelic, Garage Rock, Rock Band. From the parts of Arkansas where the foothills meet the delta, the Pearl emerged from the river bed in 2012 with a sound that sweeps you off your feet and pulls you out to a place where you forget about everything and nothing is taken to serious. Its the land of rock and roll and the sound of Black River Pearl fills the air. With elements of garage rock, blues, and psychedelic guitar solos, these night side boys rock. With the blues being imprinted in the heart of the pearl, having been kids of the 80’s & 90’s, rock n roll resonates. Sounds of the Stones to the Ramones can be heard blended with that garage rock feel to keep you glued to the jam. 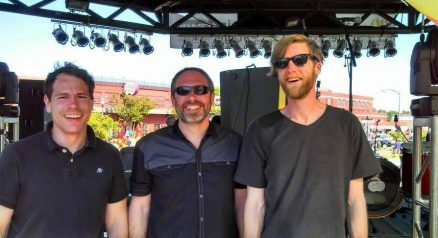 Black River Pearl consistently delivers energetic and exciting original rock and roll. The Pearl continues to grow. Getting bigger, getting brighter. Taking over towns all across America. It feeds off the crowd, filtering the energy it receives into good ole rock and roll. Comprised of brothers Chris and Alex Lynch, and Zac Wellman the band is well underway writing their second album. The first album, The Sun, was release in 2014 and contained 3 songs, centered around the topics of long nights of partying in strange towns, boozing, and video gaming. The band capped off 2014 with a performance at the King Biscuit Blues Festival. Playing shows from the St. Louis area to Little Rock, to every hot spot in between, Black River Pearl dares you to take a listen. To let it flow into your soul and rock your face.